It’s been so long since Johnny Carson retired from The Tonight Show that Jay Leno is about to hand it off for the second time. Johnny was from the town of Norfolk, NE – where half my family lives. And like me, Johnny was an alum of the University of Nebraska-Lincoln. Although I don’t think he ever had this cookie in mind, one of his catch phrases popped into my head when I ran across this recipe. If you’ve even been in one of those fancy chocolate shops like at Crown Center, you’ve probably noticed they make chocolate covered potato chips. In fact, the new “it” taste is salted caramel mocha. It’s everywhere – including my favorite Starbucks drink. When I ran across this recipe on Pinterest, I thought to myself “I have to try this recipe”. I figured it would either be the best or the worst cookie I ever made. 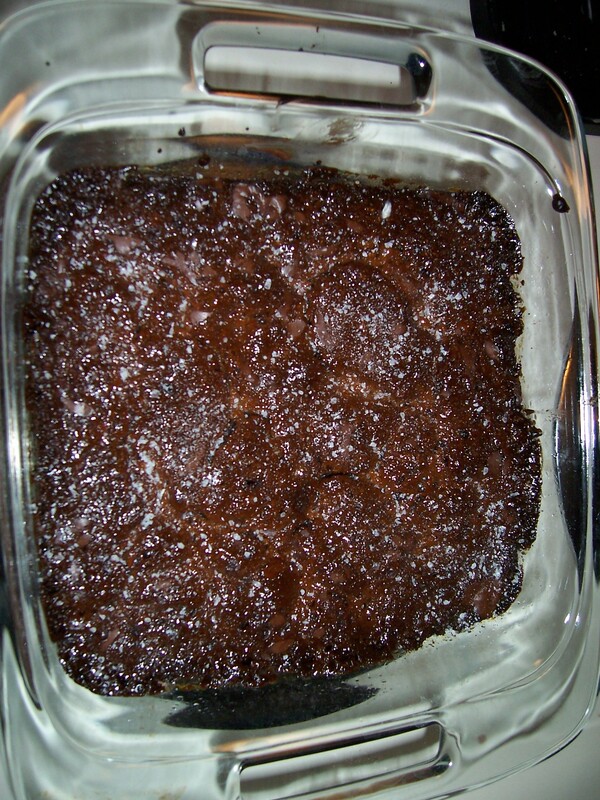 Although I don’t think it is better than my Chocolate Crinkle recipe or will be as popular as my Weight Watchers three-ingredient cookie recipe, I did enjoy it and will definitely make it again. Mix dry ingredients in one bowl. In another bowl, blend together butter, sugars, eggs, and vanilla. Slowly add flour mixture and beat. Fold in chips, chocolate chips, and Heath bits. Chill for 30 minutes. Bake at 325 degrees for 8-10 minutes. Makes approximately 3 dozen cookies. Back in my Komen days, I remember going with our Community Outreach Manager to Atchison to present our first grant to the hospital. As the only hospital/imaging center serving that region of northeast Kansas, they hosted a big pink party to celebrate. 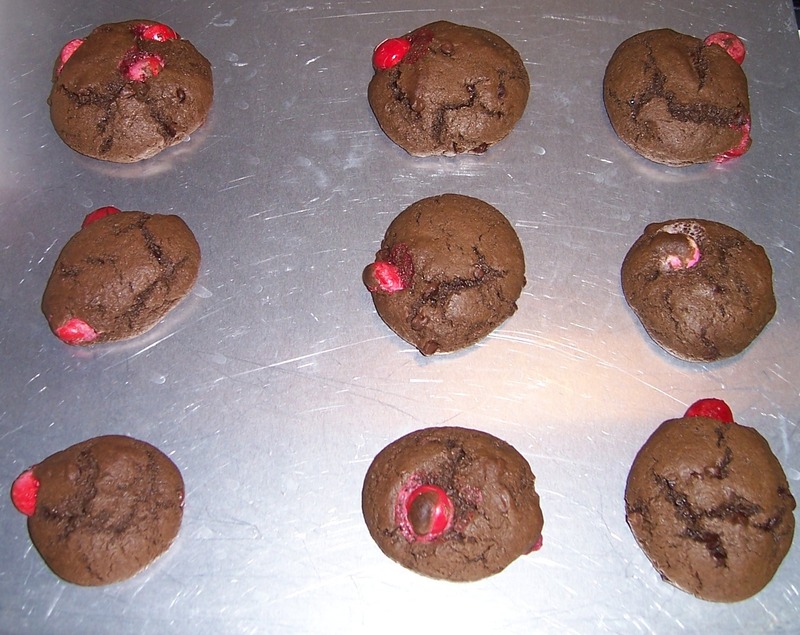 One of the things their chef made was these amazing chocolate cookies with Raspberry M&Ms. I was in love. 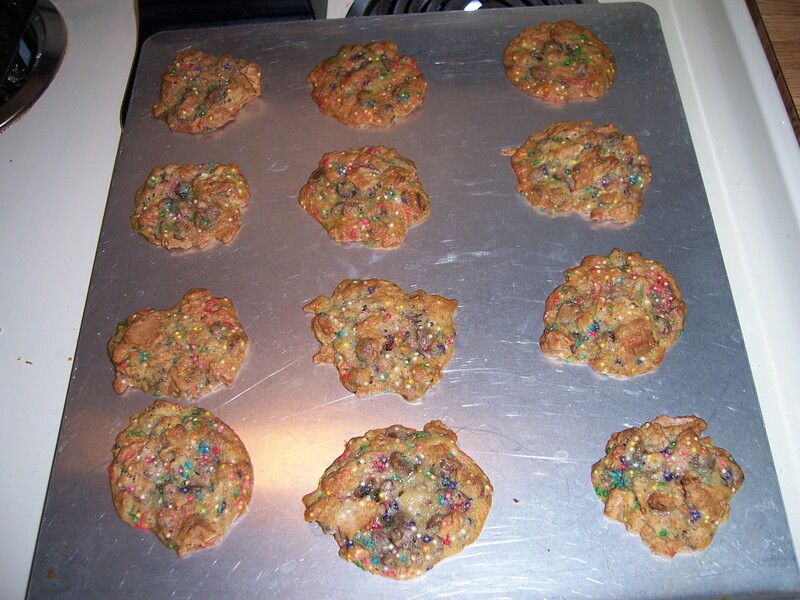 Although I haven’t been able to locate a recipe for these delicious cookies, I opted to take my best cookie recipe, remove the confectioner sugar, and add raspberry M&Ms. My you enjoys these as much as my Marriott co-workers did. They will melt in your mouth when served warm. In a large bowl, mix butter, cocoa, and sugar. In a medium bowl, combine flour, baking powder, baking soda, and salt. Use an electric mixer to add eggs and vanilla into chocolate mixture. Slowly add dry ingredients. Stir in chocolate chips. Refrigerate overnight. Roll into balls and place on baking sheet. Bake at 350 degrees for 12 minutes. I used mini-chocolate chips and it wasn’t as rich as I would have liked. I’d recommend using Milk Chocolate regular sized chips. You might even want to use 3/4 cup. I used 1/2 c. Raspberry M&Ms. That put only about one M&M per cookie. You might want to use 3/4 or 1 cup of M&Ms. I didn’t add but you could easily add a tsp. of raspberry syrup instead of adding more M&Ms. Fall is officially in the air. The low temperature last night was is in the upper 40s with a high in 70s. This is my kind of weather. 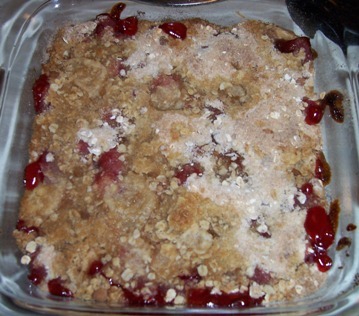 Craving cherry crisp, I went to my blog to search for the recipe. I was shocked that I hadn’t posted it for all of you yet. This recipe comes from my mother. Super easy and very tasty. It’s one of my favorite recipes. It serves up delicious warm or cold, with ice cream or fat free Cool Whip. Enjoy! Crumble flour, oleo, and brown sugar with a fork. Add oatmeal and mix. Pour 1/2 into a 8 inch square pan. Pour cherry pie filling over crust. Sprinkle with remaining mix. Bake at 350 degrees for 30-40 minutes. When I was a kid, one of my sister and my favorite cereals was Ice Cream Cone Cereal. It was recently listed in a “You know you are a kid from the 80s if…” list on the internet. It made my sister and I laugh. I think one of the reasons we liked the cereal so much was because we loved getting sugar cones when we went to Goodrich. This recipe came from my most recent issue of Taste of Home’s Simple and Delicious Magazine (August/September 2013). I happened to have some sugar cones at my house that I bought for another recipe so I decided to give it a try. The smell of it baking is like that wonderful smell when you walk into a homemade ice cream store – like Murray’s or Sylas & Maddy’s (my KC favs). It also combines a soft cookie with a crunch. I think it would be fabulous to serve these warm with homemade vanilla ice cream. Heaven in your mouth! Preheat oven to 375 degrees. Cream together sugars and butter. Add eggs and vanilla. In a separate bowl, mix flour, baking soda, and salt. Slowly add to creamy mixture. Gradually add sprinkles and chocolate chips. Fold in sugar cone. Scoop onto baking sheet and cook for 8-10 minutes. I also used about half as much sprinkles as recommended. Still pretty and crunchy. I love Thin Mint Girl Scout Cookies. I usually buy three boxes when they are one sale. Frozen Thin Mints with cold milk is such a refreshing treat anytime of the year. I also like to find recipes where I can incorporate these sweet treats. This one came from Pinterest. If you didn’t stock pile for the year like I did, you can also substitute Keebler’s version available throughout the year in your grocer’s cracker/cookie aisle. 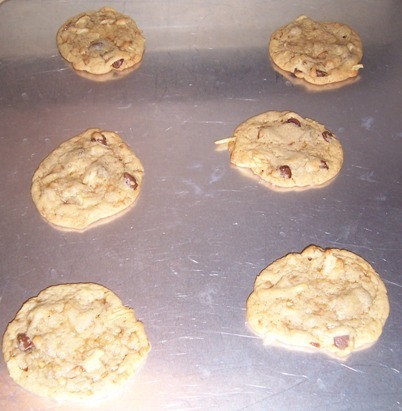 Melt chocolate chips in the microwave for 1 1/2 minute on high, then stir every 20-30 seconds until melted. Coat Chex, add cookies and stir. Add powder sugar and stir again. 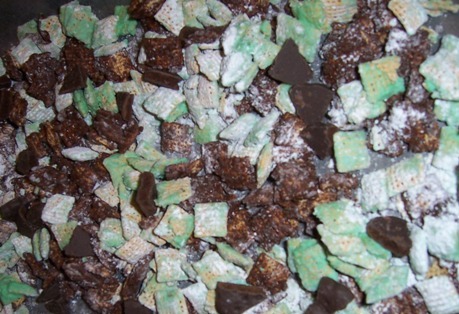 Melt chocolate and add green dye. Coat cereal and stir. Add powdered sugar and stir. Mix both cereals together and let cool before serving. Living in Kansas City, I think it is a requirement to eat BBQ. The funny thing about Kansas Citians is that everyone has their favorite barbeque restaurant – and you won’t always get the same answer. My personal favorite Fiorella’s Jack Stack Barbecue. But I’m very lucky to live less than a mile from Zarda’s BBQ so I can enjoy the smell of barbecue almost any day I decide to go for a walk. And this weekend, I also can enjoy smells from the Lenexa BBQ Cook-off just down the street. I ran across this recipe using Sweet Rays BBQ Sauce on Facebook a few weeks ago. I had two chicken breasts thawing in my fridge so I decided to give it a try after work one day. I cut them in half and they cooked up in about 2 1/2 hrs on low. It is very juicy and full of flavor. Sweet sauce with just a bit of a kick. 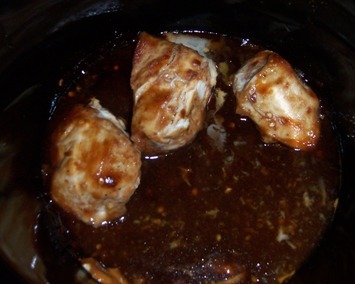 Place pieces of chicken in a crock pot. Mix remaining ingredients and pour over chicken. Cook on low for 4-6 hours. I ran across this recipe a few weeks ago in The Kansas CityStar’s Sunday coupon section of the paper. Very easy and flavorful recipe. However, I think my recipe for the Salted Caramel Pretzel Brownies is even better. Mix box of brownie mix according to directions. Pour into a 8×8 square pan. Melt caramels and milk in microwave for 1 minute on high, then 10 second intervals until smooth. Pour over brownie mix. Bake according to brownie mix directions. Remove from oven sprinkle with coarse sea salt. Cool before cutting. Yesterday was the one year anniversary of my blog. I had the best of intentions to post but got caught up watching the Oprah interview with Lance Armstrong. As a celebration of one year sharing my favorites and testing new recipes, I thought I would share one of the best new recipes I’ve made in 2013. I hope you enjoy this recipe from “Favorite Recipes – MS Forward.” I got this cookbook from my aunt Linda. Two of her daughters (Jenny and Jeanna) battle MS every day. Jeanna was one of the people who helped put this fundraising cookbook together. You know what I say, the best recipes come from cookbooks like this because people only share their best recipes. Hope you make this for your family on this long holiday weekend. In a saucepan, combine corn syrup, butter, and brown sugar. Simmer til syrupy. Pour mixture into the bottom of a 13 x 9 sprayed glass baking dish. Layer with six slices of bread. Stack second layer of bread on top. In a bowl, beat together eggs, milk, vanilla, and salt. Pour over bread. Cover pan and refrigerate overnight. Preheat oven for 350 degrees. Uncover pan and bake for 45 minutes. Serve hot or warm. Notes: This reheats well and doesn’t leave a messy pan. I’m at my mother’s house in Nebraska celebrating Christmas. It started snowing the big fluffy flakes a couple of days ago. If you aren’t from a part of the country where it snows, this is the perfect snow. It’s easy to scoop, will melt fast, and looks pretty. However, we got 6 inches which makes travel around town a little difficult. I cooked up this quick recipe before going out to help clean the snow off my sister’s car. 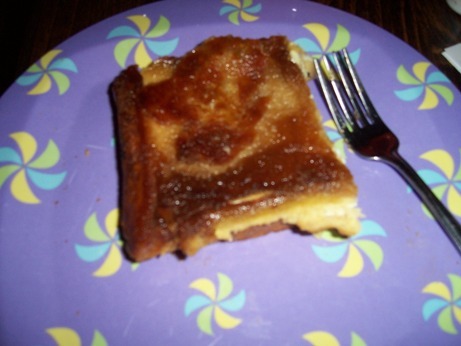 I loved this new recipe from Pillsbury.com and I hope you will too. Open and remove cinnamon rolls from package. Slice in half. Wrap half way around sausage and secure with a toothpick. Bake at 350 degrees for 12-15 minutes. While cooling slightly, mix syrup and icing in a microwave safe bowl. Heat for 20 seconds on medium (50%). Serve as dipping sauce for cinnamon rolls. Nutritional Information: 470 calories, 18 g. of fat, 5 g. saturated fat, 2.5 g. trans fat, 20 mg cholesterol, 850mg sodium, 68 g. Carbs, 1 g. fiber, 33 g. sugars, 7 g. protein. My mother misunderstood me and bought regular cinnamon rolls. It worked – so consider buying the reduced fat kind. She also bought sausage that needed to be cooked first. Just cook them in a pan before wrapping with cinnamon roll. I used about 1/4 c. light Mrs. Butterworths syrup. Another great way to reduce fat and sugar intake on this recipe. I would also suggest looking at veggie sausages like Morning Star. They taste pretty good and you reduce calories/fat here as well. When I was in high school, I remember getting really tired of eating the same things. I started digging through my mother’s cookbooks when I ran across this recipe. It’s from my Great Grandma Reith’s church. It’s a tiny country church just outside Concord, NE. 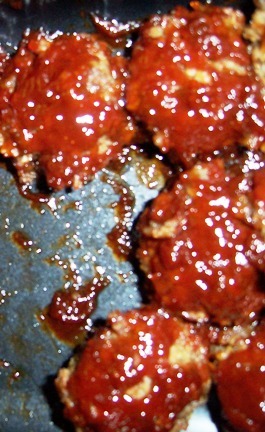 I found this recipe for meatballs that uses a sweet homemade barbeque sauce. The recipe was really large so I halved it. Even at that, you can still fill a 13 x 9 baking dish full of pretty good sized meatballs. Perhaps this recipe is the reason I like sweeter BBQ. Line a 13 x 9 pan with foil. Mix all meatball ingredients together and form balls. Mix all sauce ingredients and spoon over meatballs. Bake at 350 degrees for 1 hour.